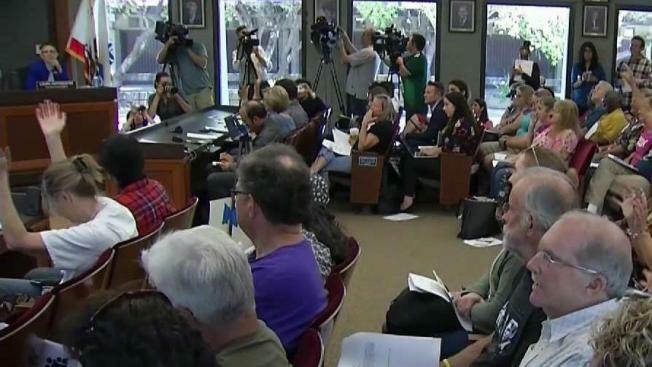 The Concord City Council scheduled a special meeting for Wednesday to discuss news reports that the U.S. Navy may be planning to place a detention facility for up to 47,000 immigrant detainees at the former Naval Weapons Station. Jodi Hernandez reports. After uproar and protests over proposed plan to use the Concord Naval Weapons Station as a facility for immigrant detainees, officials announced Thursday that the East Bay center is "not currently being considered." The Department of Defense confirmed to Congressman Mark DeSaulnier, D-Calif., that its department-owned Concord Naval Weapons Station land has not been asked to host a detention facility. "We will also be pushing the Navy to fulfill its obligation to transfer the weapons station to Concord effectively eliminating it as a future option," DeSaulnier said in a statement. The announcment comes after dozens of people turned out Wednesday to urge the Concord City Council to do everything in their power to prevent the federal government from building a mass-detention camp in the city. Several of them argued that the presence of such a camp would adversely affect property values and quality of life for Concord residents, while others focused on the apparent moral hazard involved. Some used the term "concentration camp." One man, Kenji Yamada, who identified himself as being of Japanese descent, likened the proposed detention facility to the internment camps that authorities forced Japanese-Americans to live in during World War II. An elderly woman who identified herself as a retired schoolteacher called this nothing short of a fight "for the soul of America." But Wednesday's proceedings appeared to be much ado about nothing. Contra Costa County Sheriff David Livingston sent an email to the council Wednesday morning notifying them that his sources in the California Office of Emergency Services report that "high ranking officials in the Department of Homeland Security" have said that no relocation camps will be established in Concord or anywhere else in California. If at some point in the future the proposal should appear to be on the table again, the City Council's next step will likely be to evaluate their legal options. Those conversations would likely take place in closed session, which is standard practice when discussing pending litigation. The city has long been in the process of buying Naval Weapons Station Concord from the Navy, which Councilman Tim McGallian said may put them in a unique position to put up legal and procedural roadblocks. "Yes, there are some things we could do," McGallian said. Even when that transfer is completed, however, McGallian said the federal government could still repossess the property through eminent domain.